Augustus. AE quadrans. ca. 9 BC. Denomination : Copper Quadrans. Mint : Rome. Date : Issue of 9 BC. Reference : Sear-1694, Cohen-339, BMCRE-201. RIC (1)-421. Size : 15.8 x 16.8 mm. Weight : 3.38 grams. Grade : VF with very dark brown patination, and good metal. 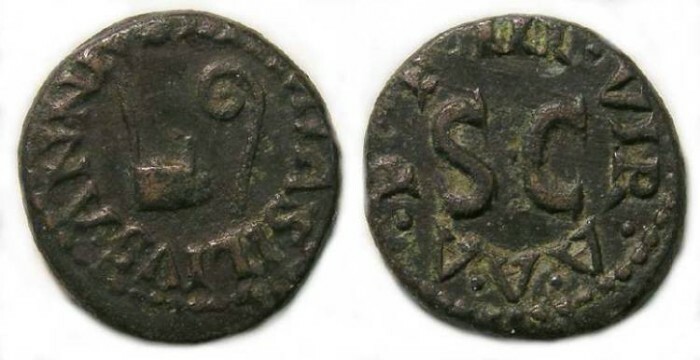 Obverse : Simpulum an lituus, with LAMIA SILIVS ANNIVS around (some letters are in part off the flan, but none are fully off the flan as often happens on these). Reverse : S C with III VIR A A A F F around.